Were your ancestors in the early colonies? The by William Fairfax, was published in 1859. 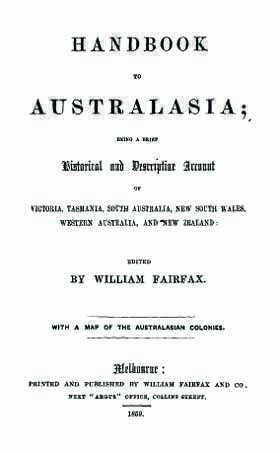 It is a brief historical and descriptive account of the colonies of Australia and New Zealand at the time. The Handbook to Australasia contains information on the history of each colony, the governments, education, population and statistics, suburbs and townships. It includes the geography and physical features of the colonies, the religion, imports and exports and also includes a bibliography of works on Australia and New Zealand. This is a rare genealogy resource for anyone exploring their family history or building their family tree.